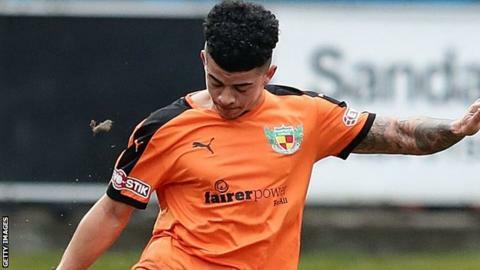 Leicester City have signed forward Josh Gordon from Northern Premier League Premier Division side Stafford Rangers. The 22-year-old has scored 11 times in 18 games in the seventh tier this season and will join the Premier League champions' under-23 side for the rest of the season. Rangers said: "We are proud to have played a part in a young man's journey to a top club." Gordon had eight years at Stoke before dropping into non-league football. Former Leicester player Stan Collymore began his career with Stafford, while Foxes and England striker Jamie Vardy started out at Stocksbridge Park Steels, also in the seventh tier.